Sponsored by the Nikolaous Institute and VicHealth and presented by Women’s Health in the North, Women’s Health Goulburn North East and Australian Domestic & Family Violence Clearinghouse. This Australian-first conference was opened by the Deputy Commissioner of Victoria Police, Tim Cartwright, and featured keynote speakers: Elaine Enarson, leading international researcher on gender and disaster; Lois Herbert, Manager of the Battered Women’s Refuge in Christchurch; and Megan Sety from the Australian Domestic & Family Violence Clearinghouse. The conference included a mixture of presentations, panel discussions and interactive workshops, and provided a perfect forum for the launch of the first Australian research to examine the impact on relationships after a natural disaster, The Way He Tells It, from Women’s Health Goulburn North East. Issues raised in this research were considered by the twelve key players in disaster management in a Hypothetical. The day concluded with five Action Planning Workshops to give delegates the opportunity to discuss the implications of the conference learnings and identify achievable actions. Aunty Diane Kerr from the Wurundjeri Tribe for Welcome to Country. Elaine Enarson – Women, disaster and violence: International patterns, responses and emerging issues. Debra Parkinson and Claire Zara – Introducing The Way He Tells It the first Australian research to examine the impact on relationships after a natural disaster. Sharon Burke and Linda Haggar – Hearing Women’s Voices from the Bushfires. Lois Herbert – The Christchurch Earthquakes — we are survivors. Megan Sety – Natural disasters and intimate partner violence: what the international research tells us. Dr Christine Eriksen – Social Geographer with the Australian Centre for Cultural Environmental Research at the University of Wollongong. John Burgess – Former chair of the Flowerdale Recovery Committee. The art therapy space at this conference provided a place for people to explore art materials that could help express what was on their mind and/or take a load off their mind. Paint, pastels, textas, pencils, collage materials-images and a variety of papers all sat waiting to be utilized. There were opportunities to make 2 or 3 dimensional work, individual and/or collaborative pieces. Some participants had used art materials before; others were adamant they couldn’t ‘do art’. Others were sure of what they wanted to do, as well as those who were equally as happy to just talk and dabble. There were sometimes words or statements that accompanied the art work, often a narrative would sum up what they saw in their work. There was no specific emphasis on finished products as time was limited due to the nature of workshops and addresses. Most comments were about the freedom to indulge in the process of colour making, exploring materials and making marks. Mostly people expressed their enjoyment of experiencing a relaxing non judgmental environment away from the main hub of the conference. 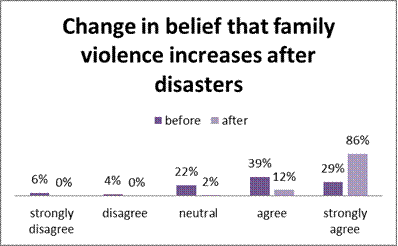 We asked for level of agreement with this statement: ’Before attending this conference, I believed that family violence increases after disasters’ 68% agreed or strongly agreed BEFORE, and this figure increased to 98% AFTER the Conference, with 86% agreeing strongly. 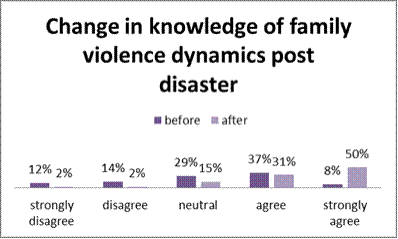 We asked for level of agreement with this statement: ‘Before attending this conference, I was aware and knowledgeable about the dynamics of family violence after a disaster s’ 45% agreed or strongly agreed BEFORE, and AFTER, 81% agreed or agreed strongly they were more informed about this. Sharon and Linda’s presentations were the highlight. They were incredibly courageous, that’s the stuff that transforms people. I work in two roles covering both DV and Disaster (flood worker) for two different organisations. I believe there is a lack of understanding. This is the first time I’ve been able to bring my two worlds together. I will be able to go back to both the organisations I work for and stress my learnings from this conference, great perspective. I found the conference empowering. Lots of things to think about and take home. I need to think about how I can fit this knowledge into my community. Issues raised I have seen over the past few years [since Black Saturday} – there is a need for reform. The information is definitely reflective of what I’ve seen in my community. Conference has been fantastic and has given me the opportunity to network and connect with key people; as a result of being here I have spoken to the right people to action some of my current concerns. Terrific, a very important conference, haven’t had a conference on women and disaster [before]– research a fine piece of quantitative work, which will be important nationally and internationally. Great opportunity to get people together to explore issues, lot more work to come out of it. I loved the conference – I didn’t know anything about the issues, now I feel I can walk away and understand it. Inspiring, informative, important research not just for Australia but internationally as well. Was very moving to hear survivor stories – how brave they were to tell their stories.